All transactions are safe and secure with a reliable history in online purchasing behind each of our associates. Buy the Lost Boys Peter Pan t-shirt to own Peter Pan clothing and merchandise. 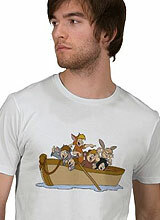 This Peter Pan tee features his brave and loyal Neverland companions, the Lost Boys. Most people don't know his friends' names, so I will fill you in on this nice little piece of trivia. The child dressed as a bear is Curly, the skunk is Tootles, the rabbit is Nibs, the fox is Slightly and the raccoons are twins named Binky and Marmaduke. Furthermore, they all live together in a tree covered with rope nooses called Hangman's Tree. To see or read about it for yourself, snag a Disney Peter Pan DVD or book. Get other Peter Pan merchandise like Tinkerbell dolls and figures. In addition to the Lost Boys Peter Pan tee above, browse the Peter Pan Clothing Gallery for more apparel like men's and women's clothes, kids shirts or hoodies.